New research has shown the indirect impacts that invasive species can have on an ecosystem. 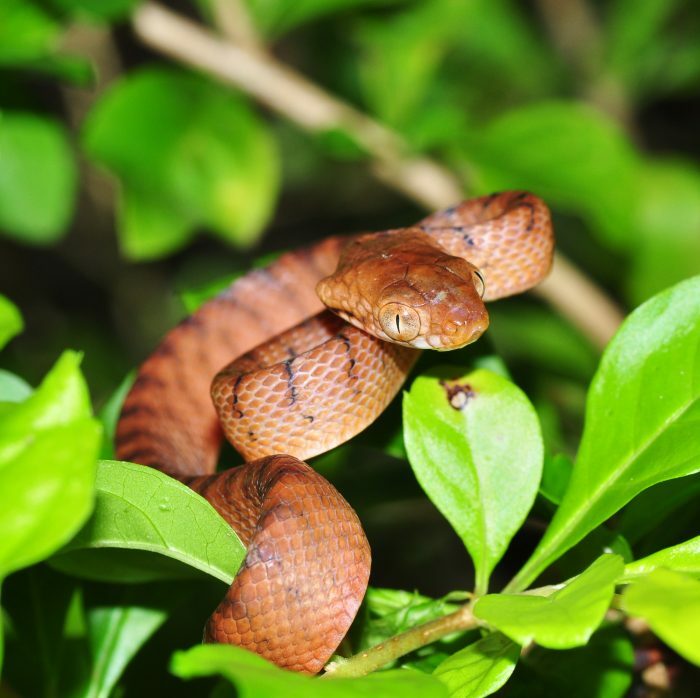 The study, published in Nature Communications by scientists at Iowa State University, focused on the brown tree snake. Since being introduced into the forests of Guam, this species is affecting the regeneration of trees on the island over a span of decades. This shows the potential for invasive predators to cause easily overlooked yet serious consequences as a result of the eradication of species. 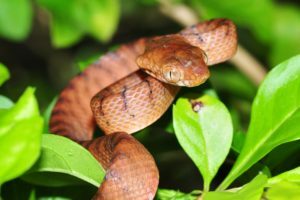 The brown tree snake first appeared in Guam (a US territory in the western Pacific Ocean) after World War Two, probably stowed away on military cargo ships. 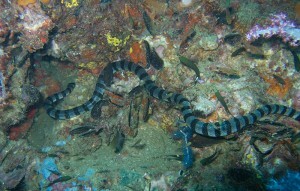 The snake has no natural predators on the island, so quickly increased in numbers. It also quickly drove 10 out of 12 forest bird species to extinction and drastically reduced the remaining two species. The impact on the birds has been well documented, but less was known about the other impacts on Guam’s forests, especially because some of the bird species were important seed dispersers. Between 2001 and 2010, the scientists collected seeds from two tree species in the jungle on Guam and, for comparison, three nearby islands where the birds are still present. The findings showed that seeds on Guam fall directly underneath the parent tree, while seeds on the other islands are moved throughout the jungle by birds. Directly underneath parent trees, seeds and seedlings are less likely to survive. In addition, most of the seeds on Guam fell with the fleshy fruit still covering the seeds, whereas on the other islands the seeds had been ingested and excreted by birds. When this happens, the seeds are two-to-four times more likely to germinate than seeds still with their fruit flesh. The impacts combine to show that a loss of frugivorous birds from Guam leads to a 61 to 92 percent decline in seedlings of the two tree species. “It’s a less obvious impact than losing all the birds because the change in the plant community is gradual, but Guam is becoming an increasingly different forest now that it has lost all of its frugivores, said Haldre Rogers, lead author of the study. She said indirect impacts on plants caused by invasive predators can be difficult to measure because most places haven’t experienced complete extinction of important plant mutualists. Guam provides a unique case because of the complete absence of birds in the forests. Although very little is know about these creatures, a lot of species appear on the ICUN Red List. 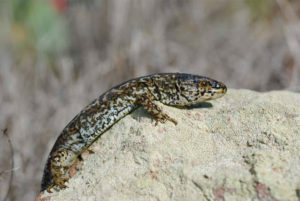 Only one appears on the CITES list, the Laticauda crockeri, listed as vulnerable.